A great way to photograph hippos is from the water, either when paddling a canoe or traveling slowly in a motorized boat. Although it's possible to snap hippos from land, they will usually be some distance from the banks of the river or lake, so you'll need a longish telephoto lens, preferably 300mm or more. 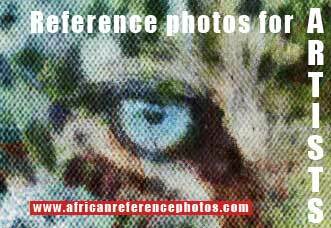 If a hippopotamus is near enough to allow a shorter lens, watch out! These massive animals are deceptively agile and can be out of the water in a split second, charging you on land at speeds of up to 40 km/h. The main advantage of photographing hippos from a canoe is that you can get quite close to them, whether they're in the water or on the banks, without upsetting them unduly. But it's not advisable to try this on your own. Instead, join a canoe safari where you'll be led by an experienced river guide who understands hippo behavior and knows the river intimately. The lower Zambezi River is renowned for its canoe safaris, operated from both Zimbabwe and Zambia. This section of the river, lying between two national parks - Zimbabwe's Mana Pools (a World Heritage Site) and Lower Zambezi in Zambia - has little river traffic. There are also many channels and islands, making for excellent game viewing. The biggest drawback of photographing from a canoe is that it's almost impossible to remain totally stationary because of the current. So you're always shooting from a moving position, making it difficult to frame and focus your subject. And then there's the adrenaline rush and shaky hands, inevitable when you know you're about to paddle over submerged hippos ahead, while huge crocs sun themselves only meters away on the bank. On these canoe safaris it's advisable to have your camera gear insured in case you take a dip. This quite often happens as you're stepping on to land from deepish water or, worst-case scenario - when you're tipped over by a hippo. On a recent canoe safari on the Zambezi, I opted to take only a small Olympus digital camera with a good zoom lens, rather than a bulky and more expensive SLR body and lenses. 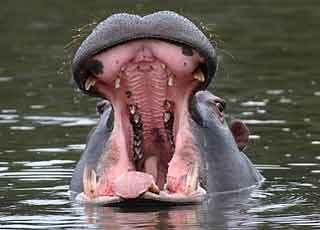 To find out more about hippos, see Hippo Information.